If you’ve ever played the piano before, you’re well aware of how easy it is initially, but how difficult it can become. When I first played the piano, I thought I would be playing difficult classical music like Bach in no time. Boy, was I dead wrong. Knowing how difficult playing the piano is makes this performance you’re about to witness that much more incredible. Because these performers aren’t playing a regular piano. 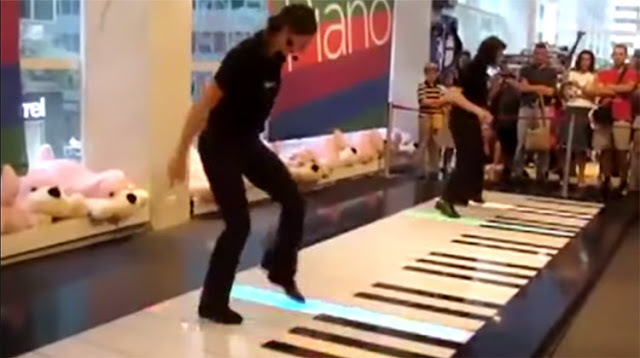 No, they’re playing a floor piano. That’s right, in this video, you’ll watch two people perform Bach’s Toccata in D minor on a floor piano. The way these two prance around the room as they perform this masterful piece is just wonderful to behold.